Atlas Reactor is weird, interesting game. It’s a little bit XCOM, as you’ve got a modern turn-based strategy interface with which to select movement and commands. It’s a little bit MOBA, since it’s a team-based online game where you’ve got to coordinate with your fellow players to succeed. You can also try it out with the game’s Free Mode launching next week. Atlas Reactor is switching from a free-to-play model to a buy-to-play model (otherwise known as the usual way games are sold). 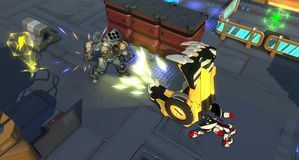 Atlas Reactor is still in its closed beta phase, but developers Trion Worlds have decided their game would best be suited to a buy-to-play model. Now future owners of the game will obtain all current and future Freelancers (the characters in Atlas Reactor). Trion Worlds has announced that their turn-based MOBA Atlas Reactor will begin a new "Alpha Sneak Peek" on February 18th, including a new map and playable characters, as well as a new mod system.